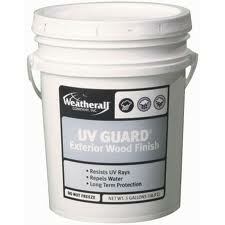 Weatherall's premier interior/exterior wood finish. Contains UV absorbers that resist the sun's harmful rays. UV Guard repels water and contains a biocide to inhibit mold and mildew. Ultra Low VOC. Less than 55 grams/liter VOC emissions.